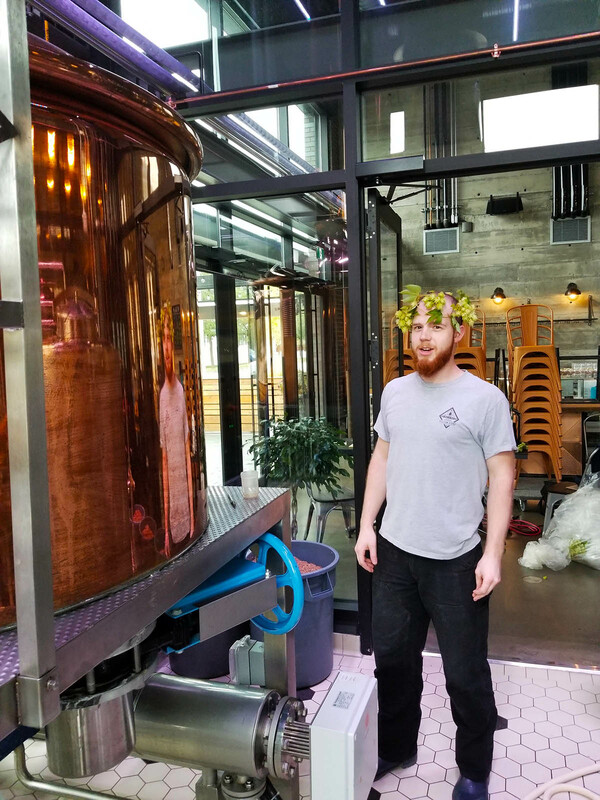 The next in our series of “Stories Behind the Beers” is the tale of a very unique beer that we’ll only make a single time per year. And that’s only if the stars align to provide us with fresh whole cone hops. 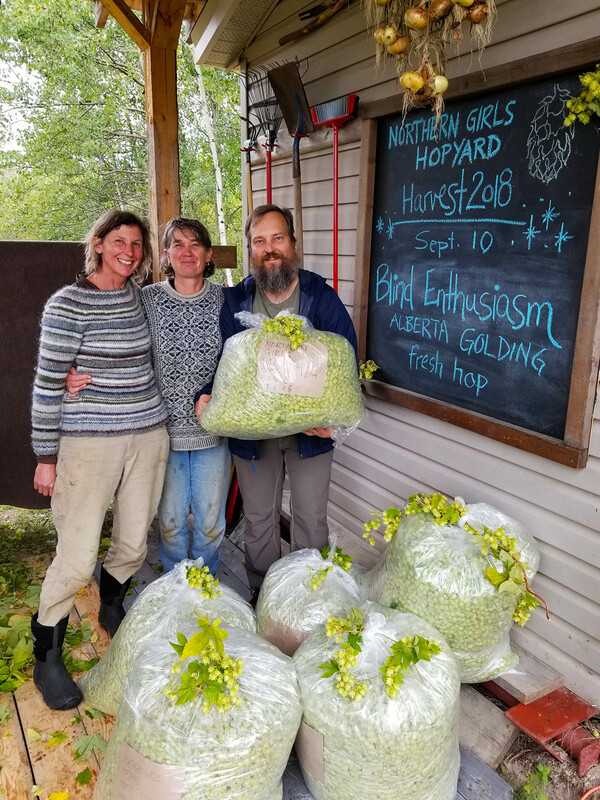 The stars did align for us this Fall, and we’ve made a very special batch of DEB, called a wet hop ale, using fresh, Alberta-grown Goldings from the Northern Girls Hopyard (part of Windhover Farm). The finished Deb’s Wet Hop Ale in all of its glory on a lovely Fall day! 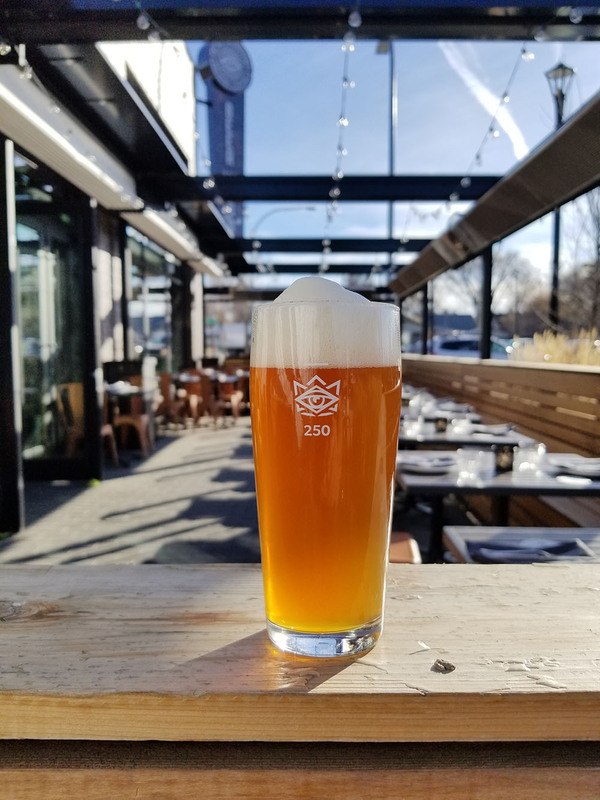 If you’ve been to Biera you’ll likely have seen that one of our fairly regular beers is DEB, a gently malty, moderately bitter beer that uses English yeast, malt, and hops. The aroma and flavor hops we use are a specific variety of Goldings hop from southern England called East Kent Goldings that give DEB its delicious crisp, bitter mineral finish, underpinned by herbal and orange marmalade hop notes. 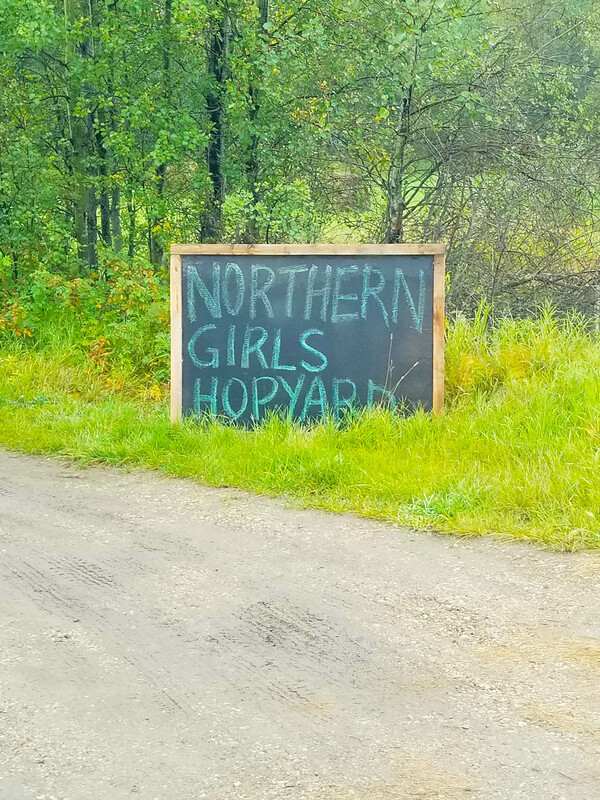 It turns out that the Northen Girls Hopyard, just north west of Edmonton, happens to grow Goldings (maybe we can call them Central Alberta Goldings). The hopyard also happens to be close enough to be a short drive from our brewery, thus allowing us to harvest hops in the morning directly from the bines, process and pack them up by noon, and deliver them into our unique version of a hop back by early afternoon to be added to an in-progress brew. (A hop back is a vessel where hot, recently boiled wort is mixed with fresh, whole-cone hops to capture their incredibly fresh flavor and aroma). 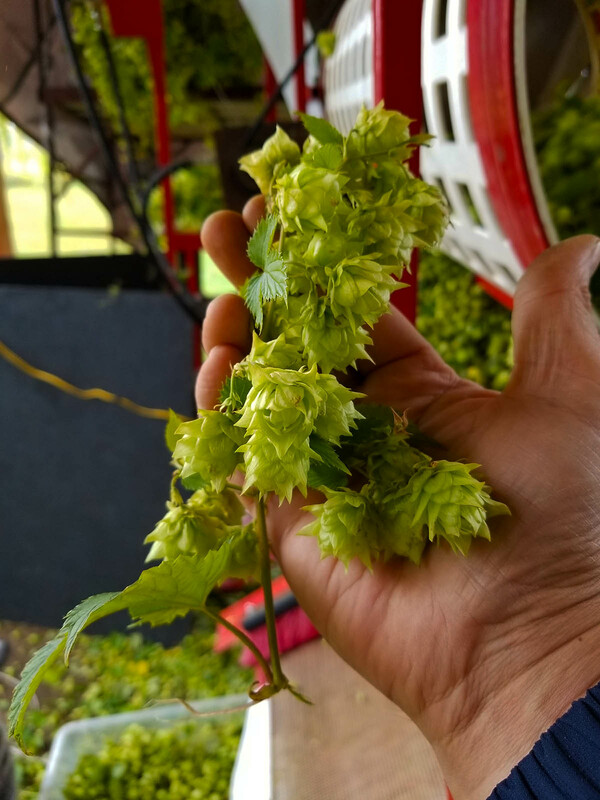 Making a wet hop ale is a huge highlight for any brewery as it’s an opportunity to use unbelievably fresh hops (4 hours after harvest in our case). 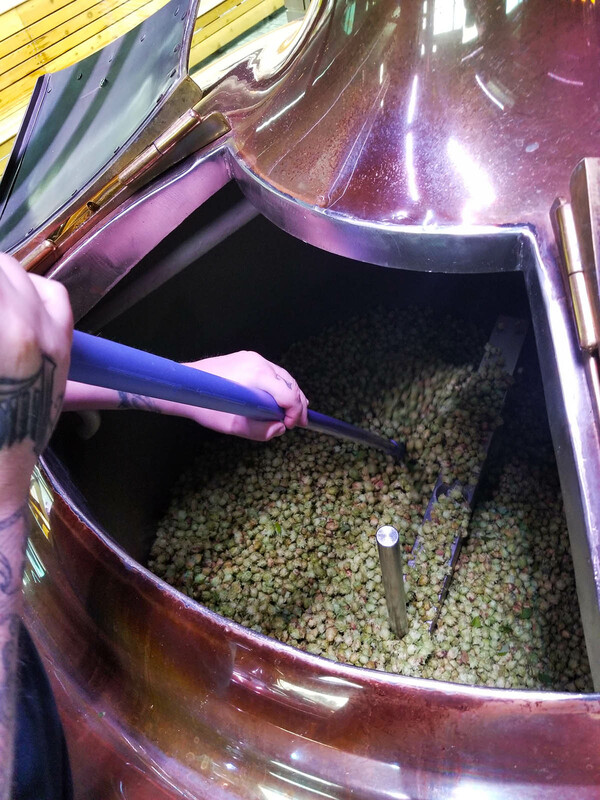 It’s different than a dry hopped ale where hops are added to a fermenter conveniently after brewing as wet hop ales must use whole fresh hop cones, and there’s an exceptionally small window during the actual brew day to add them (right after boiling). 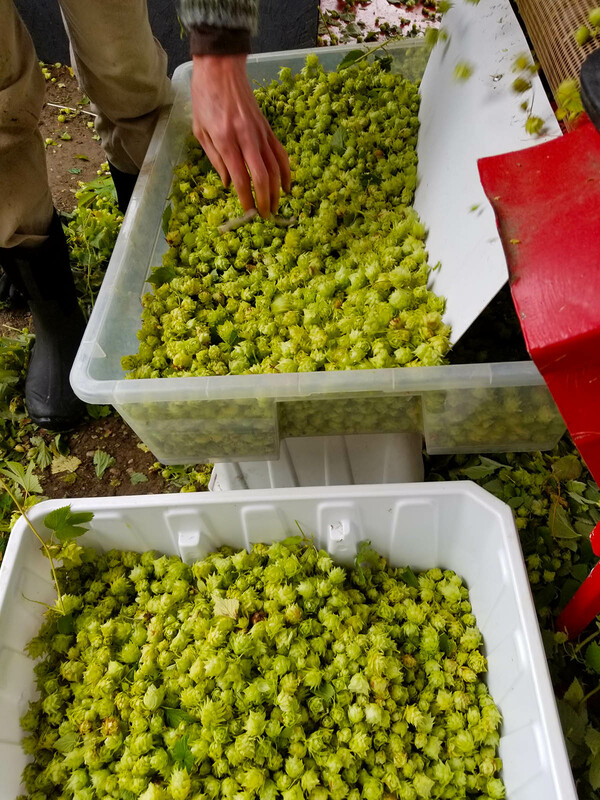 There’s no window for error, we get only a single shot at it, and wet hop ales tend to have unique and hard to replicate characteristics that make them a special, once a year treat. After a 1.5hr drive from our brewery, we appear to have arrived in the right place! 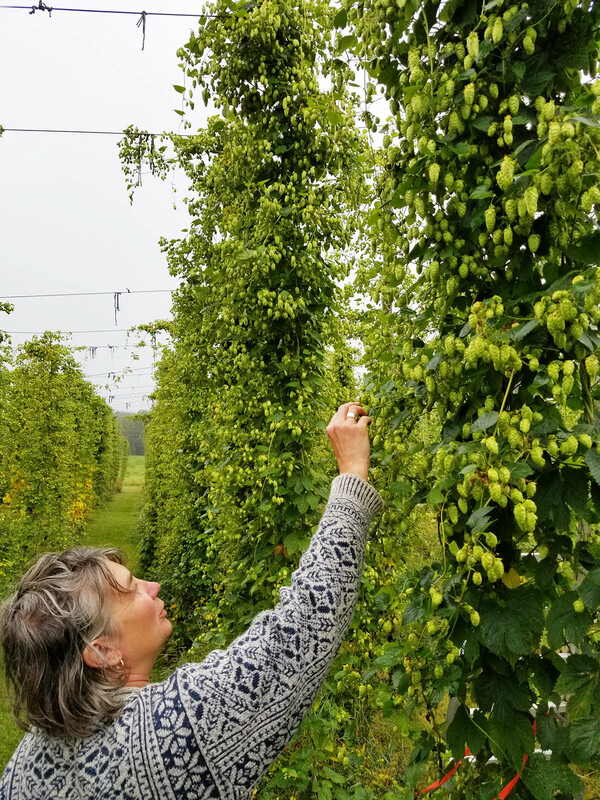 Karin takes us on a quick tour through the hopyard. 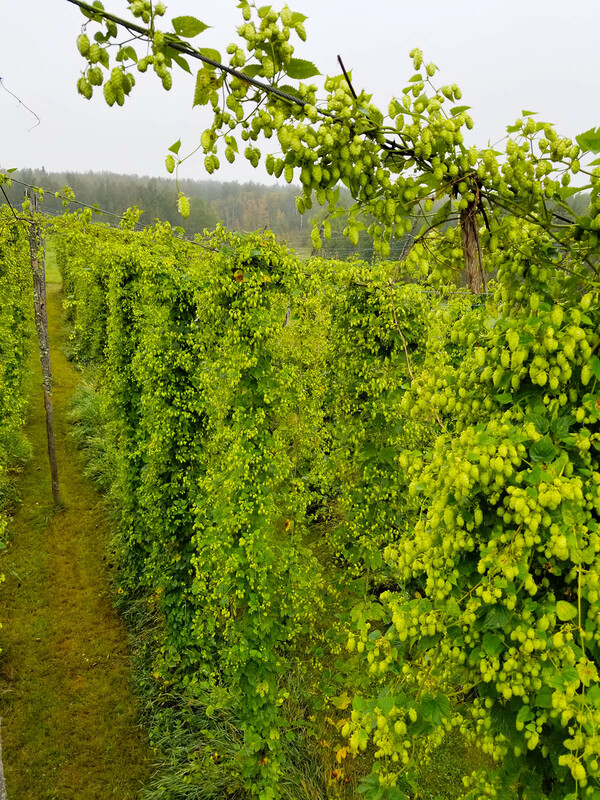 Here’s a close-up of a hop bine (yes, not a vine) showing the bright green cones that are the source of the delicious flavors in our beer. 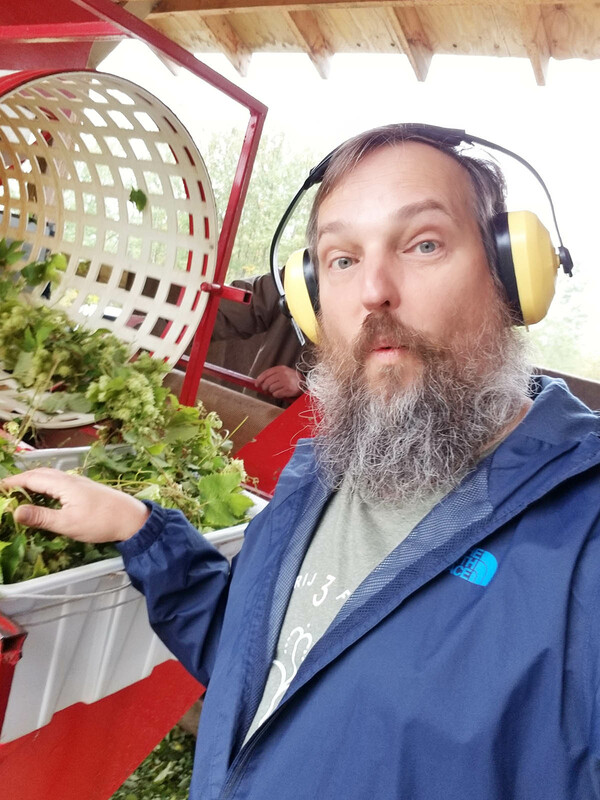 This is my surprised face when I was put to work to help process the hops! 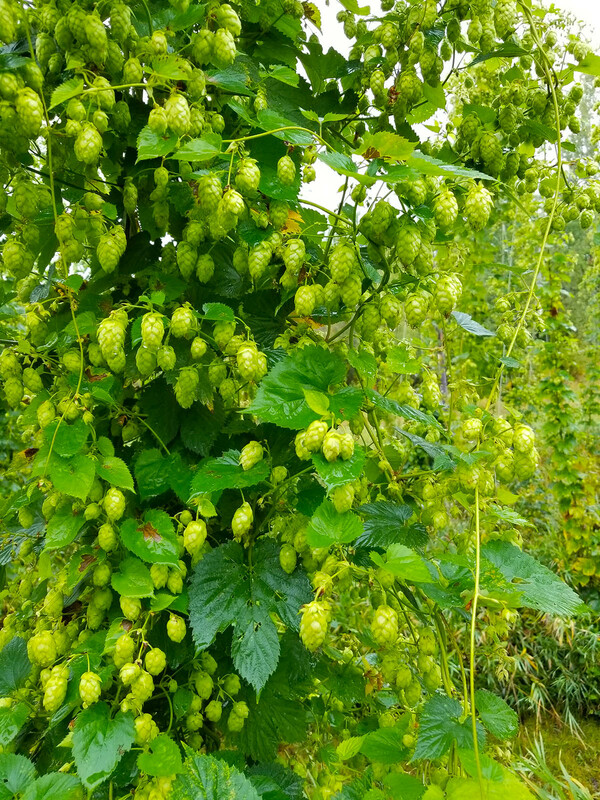 This is a nice, close up example of the hop cones. The cones are separated from the bines, placed into bins, and then bagged for transport. 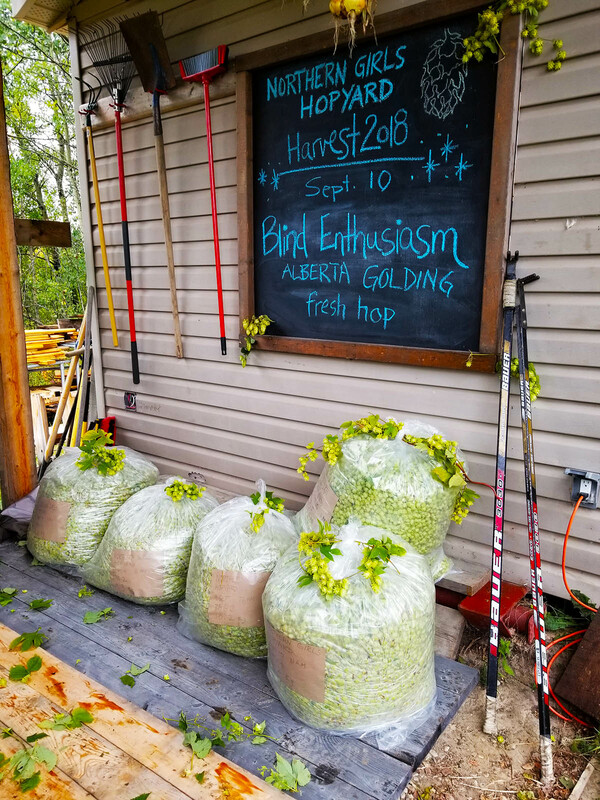 We harvested and packed roughly 60kg of hops cones for the brew. You can see this is a Canadian hop farm as there are old hockey sticks used in the harvesting. Here’s a picture of me with Karin and Catherine, the farmers responsible for this delightful crop. Here’s a final shot of the van prior to closing the door and racing to the brewery. 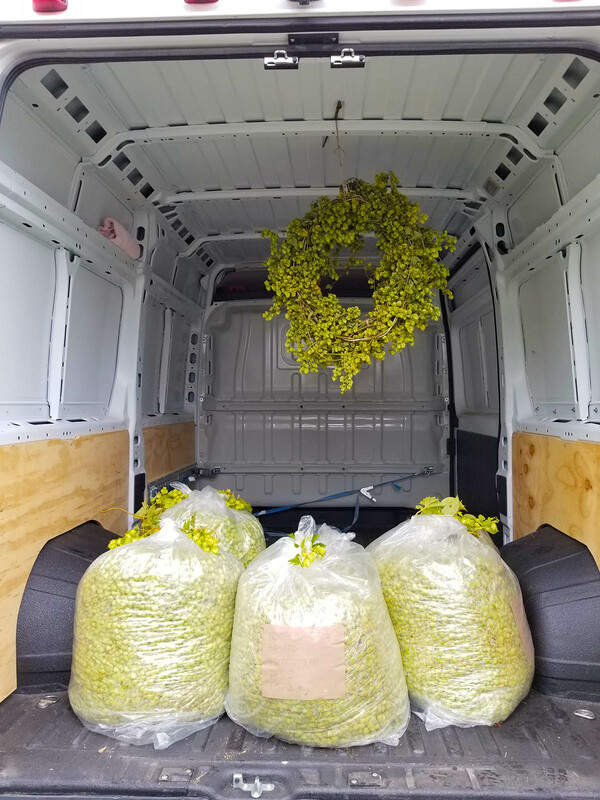 We got a delightful hop wreath gift to help ensure our brew was successful. Fast forward about 1.5 hrs, and it’s about 130pm, and Rob really NEEDS those hops as our boil is almost done. This little sequence shows him filling our Lauter Tun to act as a hop back! Because of the good fortune of our brewhouse design we were able to pull a clever trick to make this beer. We have a dedicated Lauter Tun that’s normally used for separating the wort from the spent grain before the boil. 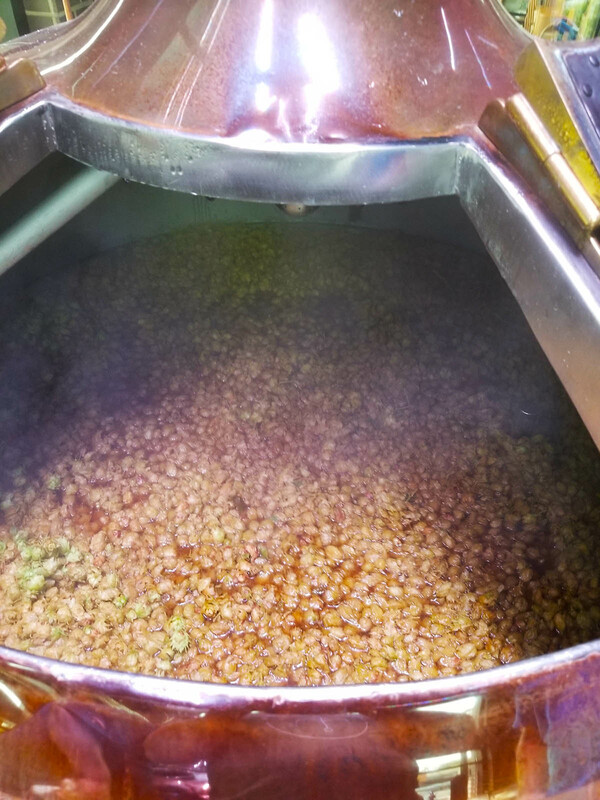 In our case, we are able to fill it with hop cones and add the recently boiled wort to create a big hop back (along with an automated agitator to keep things moving) for maximum wet hop contact! This video shows the agitator in our Lauter Tun doing its thing as we steep the fresh hop cones in our recently boiled Wort. 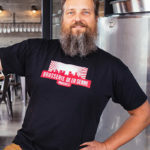 Head Brewer Rob Monk provides some commentary on the process. Here’s a still shot of the Lauter Tun filled with fresh, whole cone hops, and very hot wort. As you may imagine it smelled incredible! 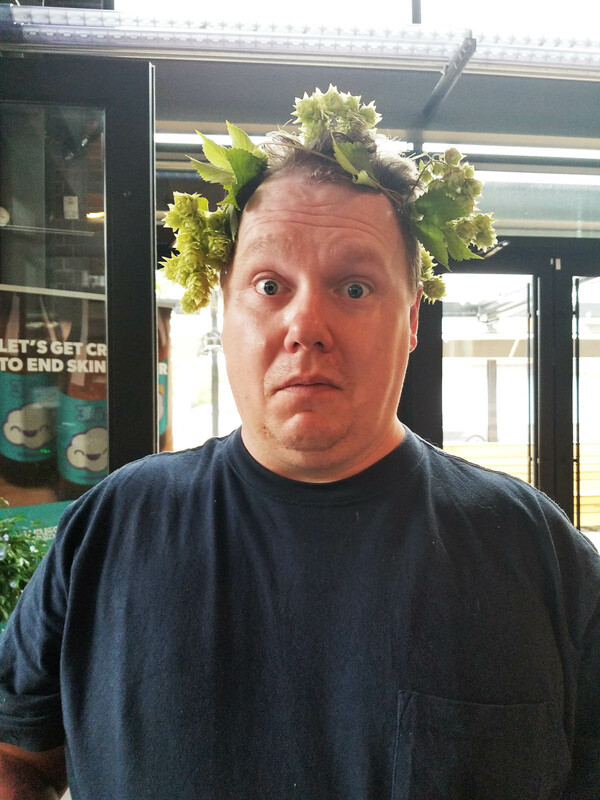 And, as is customary when doing a wet hop ale, the brewers are required to wear fresh hop wreaths. Ian still appears uncertain if this is required. Rob seems to accept this requirement, but he doesn’t appear to be enjoying it. And this is the semi-final product: one of our fermenters filled with DEB’s Wet Hop Ale. 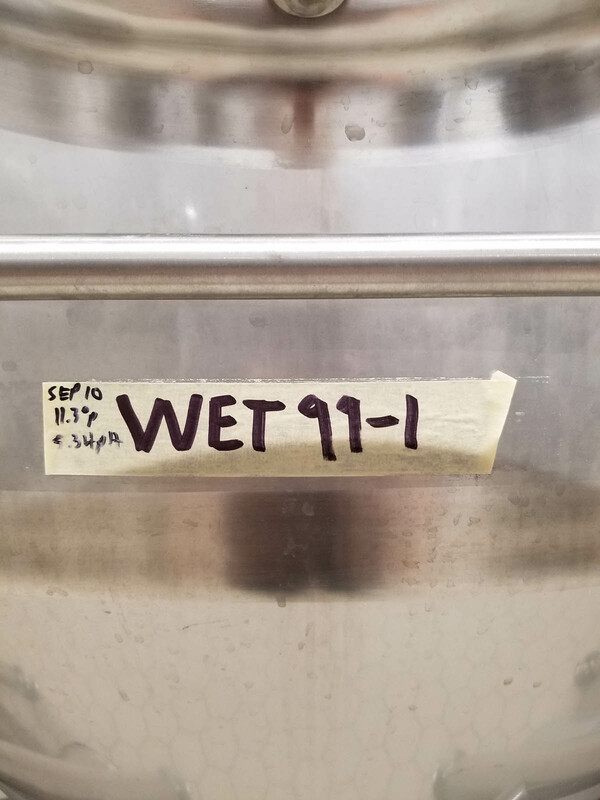 It’s also fun to call out that it was our 99th brew! 100 has happened, and it will be revealed in a couple weeks. And that concludes the story of DEB’s Wet Hop Ale. We’ll have pictures of the final beer quite soon, and you’ll need to come visit us to give us a try. It’s a one-off, once a year brew, and it’ll only be around for a short time so don’t miss out!